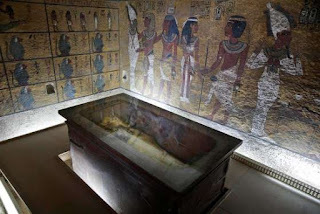 In this Tuesday, Sept. 29, 2015 file photo, the tomb of King Tut is displayed in a glass case at the Valley of the Kings in Luxor, Egypt, Tuesday. On Saturday, Nov. 28, 2015, Antiquities Minister Mamdouh el-Damaty said there is a 90 percent chance that hidden chambers will be found within King Tutankhamun's tomb, based on the preliminary results of a new exploration of the 3,300-year-old mausoleum. (ASSOCIATED PRESS) :- CAIRO — Egypt on Saturday said there is a 90 percent chance that hidden chambers will be found within King Tutankhamun's tomb, based on the preliminary results of a new exploration of the 3,300-year-old mausoleum.